The following is an excerpt from the Dynamics chapter of Bouldering Essentials. And while books are great and all they aren’t the best way of illustrating complicated movements, so I have added some embedded videos to accompany the text. When climbing bold traditional routes or soloing the climber must move in a very conservative, measured manner. 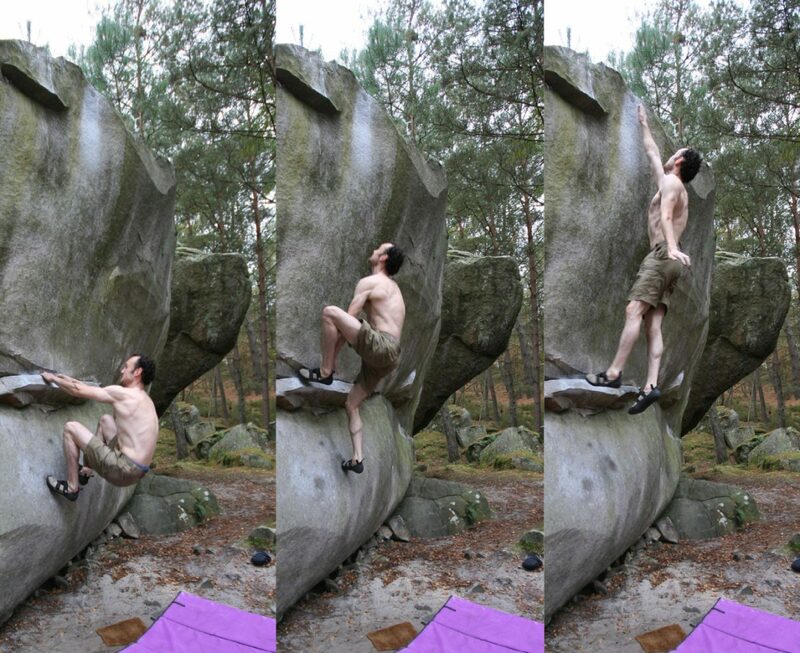 However, the boulderer is free to experiment, using momentum to do moves that would be very difficult, if not impossible, in a more static style. Of course all movement is by definition dynamic, but in climbing terminology a static move is one that is slow and balanced while a dynamic move is one that is done quickly, in one continuous motion. Most dynamic moves require a fair amount of athletic ability, this suits some climbers more than others, however, dynamic movement can be learnt and refined with practice. The term dyno is often used to describe any dynamic move, but it has a more specific meaning. SLAP A quick reach or lunge during which you have a minimum of two points of contact at all times. JUMP One hand stays on while both feet leave the rock so that you always have at least one point of contact. DYNO An all out leap during which the whole body is airborne and you, very briefly, have no points of contact. When facing a dangerous fall, the extra effort required to do a move statically is often justified by the control gained. When the target hold can only be held in a very precise manner, for example cracks, clusters of crystals, small pockets or narrow slots. On rough rock catching sharp holds at speed can be very hard on the skin. Flinging yourself at the rock is dangerous, both because it can cause you to land awkwardly and because catching a hold at speed places a very high load on the fingers, arms, elbows and shoulders. The best place to experiment with dynamics is at a quiet indoor wall with plenty of big holds and good matting. It can be difficult to effectively spot a dynoing climber and there are times when the spotter is at greater risk of injury than the climber. Both spotter and climber need to use their judgement as each situation is different. The potential landing zone for a big dyno is huge so think carefully about how and where you might land. Remember to warm-up well focusing on the shoulders and fingers. For long dynos it might be worth doing a few star jumps and stretches to prepare the big muscles in the legs. An understanding of trajectory, the path taken by the centre of gravity, is particularly important for dynamic moves. During a reach you accelerate initially before slowing down and stopping as you reach the target hold (the deadpoint). This means that gravity’s effect becomes more pronounced in the later part of a move. On vertical rock gravity pulls you straight back down, but on overhanging rock it pulls you out (away from the rock) as well as down. So depending on the circumstances your centre of gravity may travel in a curve (inward or outward), a figure of eight, a C shape (moving inward then outward) or a straight line (parallel or sometimes even perpendicular to the rock). If the target hold is bad it might be worth hanging off it first, if you can get to it, to find the best way to hold it. This will also show you how far you have to travel from the foot holds. Often the target is hard to see from below, marking it with a small dot of chalk can help but make sure you clean it off when you are finished. At the climbing wall a good way to gauge the length of a move is to count the bolt holes between holds (assuming the gaps are uniform). Sometimes reaching the target hold is relatively easy and holding the swing is the crux. The greater the horizontal gap (out, across or both) between the launch foot holds and the target hand hold, the bigger the swing will be. Depending on the situation you may reduce the swing by pulling your knees up towards your stomach or by arching your back towards the rock and allowing your lower legs to swing outwards. Good core strength is key to holding the swing. Use the momentum of the swing to get your feet back on the rock. The deadpoint is the instant in a movement when your body is moving neither up nor down. It’s the perfect time to grab a hold. Every dynamic move should generate just enough momentum to reach the target hold and no more. With accurate use of momentum it’s possible to make long reaches to very small holds. A lot of dynamics initially look and feel highly improbable, a few tentative attempts can help build confidence. On very rough rock the best tactic is to get the distance dialed before committing to hanging the hold. The legs are the most powerful muscles in the body and should be the main should of the momentum required for big dynos and jumps. Think of your arms as a pivot and your legs as a spring. Dynamic moves require a blend of power and technique. As they take less than a second and involve the entire body working in harmony, they also require good coordination and lots of practice. There are three phases to a dynamic movement: setup, launch and latch. The setup position is pretty similar for all dynamic moves. The idea with sinking down before you launch is to maximise the amount of room available for generating momentum before you reach for the target. Sometimes the best setup position may cause a huge swing once the target hold is latched, in that case you must launch from a sub-optimal position to increase the chances of holding the target hold. There isn’t any consensus on whether you should pump up and down a few times before launching. Some climbers believe that it gives a good feel for the best position, others think it’s a waste to energy. Do whatever feels right to you. Choose the lowest foot holds that allow you to keep one or both feet on. Don’t use two foot holds just for the sake of it, if they are very small or awkwardly positioned just use the best one. For long moves foot holds at staggered heights works best. The further the target the lower you should sink and the higher the foot holds need to be. Sink down by bending your legs and straightening your arms. Lock your eyes on the target. The idea behind the launch is to generate just enough momentum to carry you from one balanced position (setup) to another (latch), passing quickly through the unbalanced intermediate positions. Move upwards by simultaneously straightening the legs and pulling with the arms. The further the target, the faster you need to move, but remember that you want to stop moving just as the target hold comes into reach (the deadpoint). Move your hand(s) as late as possible. If possible leave one hand on and keep pushing down all the way through the movement. Often the crux is holding the target hold and controlling or preventing the swing. Big dynamic moves can be very hand on the skin, often failed attempts can do more damage than successful ones as the skin scrapes across the hold so once you hit the target commit 100% to holding it. If you judged the distance accurately you should reach the deadpoint just as the target hold comes into reach, this is the moment to grab it with a straight-ish arm. Prevent your feet from coming off the foot holds as your weight transfers to the target by pushing down hard on them. When jumping or dynoing, your feet will be in the air and may well swing hard once you latch the target. The target hold is usually caught with one hand, but using two hands (a double dyno) makes sticking marginal holds or holding big swings easier. Even when the target is initially latched with one hand it’s best to match it as quickly as possible. Sometime when two target holds are held it’s preferable to latch one slightly after the other one, rather than instantaneously. This is often when the holds are at different distances from the launch holds and your effectively arrive at one earlier than the other. See the examples below. A jump involves both feet leaving the rock but one hand staying in contact throughout the move. Sky, 8b in Rocklands, South Africa involves two very hand jump moves in a row. By keeping one hand on Nalle is able to very accurately hit the very small target holds and control the swing. Some problems with blank starts, that might otherwise be impossible, can be solved using a run and jump (see above). As the name suggests you run at the rock, kick off one or more foot holds and jump for the hand holds. Probably more parkour than climbing but very satisfying when it works out. Steep, difficult or blank starts can be overcome by jumping from the ground to the first good holds, this technique is known as a jump start (AKA French start). Jump starts come in three variations: a jump from the ground (see above), a jump assisted by a hand hold and a step using a foot hold to reach the target. The key to any dynamic start is launching from the point on the ground that will minimise the swing when you latch the target. It can take a bit of experimenting to find this point. Generate extra momentum by swinging your free arm(s) upwards as you jump. Catch the hold with both hands if possible. Jumping to two separate holds requires good coordination but if neither hold is sufficient on its own you have no choice. This video shows the jump of start of Karma in Fontainebleau. 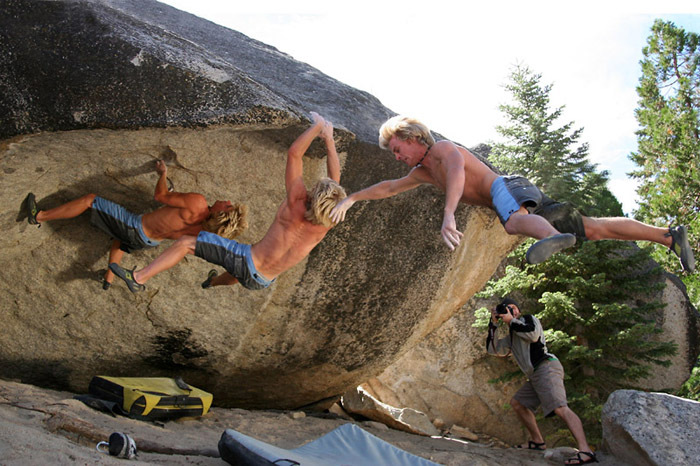 Alternatively momentum can be used to get stood on the rock rather than to latch a hand hold. Kind of a dynamic mantel move. Slapping is the most commonly used dynamic technique. On overhanging rock nearly every move is a little dynamic. 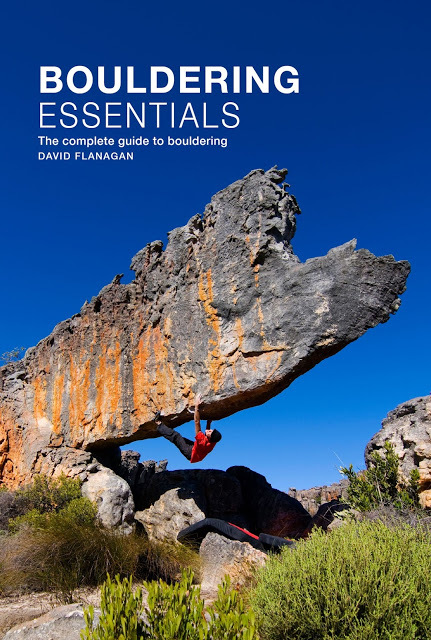 Watch any bouldering video and unless the problem is a slab or technical bridging problem then the chances are most of the moves will be slaps. Slapping has two major advantages over reaching statically. Firstly, a lot of moves are significantly easier if done dynamically and secondly it’s often more efficient ie. it’s quicker and uses less energy. Slapping is an essential skill for every boulderer. Sloping holds can’t resist an outward pull so they are particularly difficult to reach from, the lower your centre of gravity relative to the sloper the more positive they feel. Slapping initiates the movement from a low position and uses it to carry you to the target. When the target hold is small or narrow (for example a pocket) it’s easy to fumble or miss it entirely. Work on your accuracy by slapping to narrow sloping holds (make sure your fingers are well warmed up first) but avoid dynamic moves to small pockets as it’s a common cause of finger injuries. the following videos show Nalle on the Fontainebleau compression problem The Island. The first video is a great example of using a very small bit of dynamics to help with a hand move from a compression position. In fact in this example most of the momentum comes from head movement. A move later a slightly longer reach is done dynamically using more of the body to generate momentum. Note the hips dropping to initiate the movement. Really long dynos (more than 2m between hand holds) often require a stepping motion (see left). This involves pushing off the hand holds (or another high foot hold) with your foot to get extra height. Needless to say this requires serious spring and coordination. Finally this video contains more dynamic moves than your brain will be able to absorb on the first viewing.